Meet your two next best friends…two little seeds – chia and flax; ‘Ancient Super Foods of The Future’. If you replaced 50% of the processed or refined foods that you are now eating with these two types of foods, you would experience unbelievable good health, energy and easy and effortless weight loss. Some people call flax seeds the new wonder food and consider it the most powerful food on the planet. Studies show that flax seed helps to fight everything from heart disease to diabetes to breast cancer. This tiny little seed carries one of the biggest nutrient payloads for your body. Even though you can’t technically call it a grain, it has a similar vitamin and mineral profile to grains. But that’s where the difference ends. Cultivated in Babylon as early as 3000 BC., Flax seed was also used by King Charlemagne who believed strongly in the health benefits of this wonder seed and passed laws requiring his subjects to consume it. Centuries later we now have the technology and research to back up what Charlemagne suspected all those years ago. Flax see is rich in omega-3 essential fatty acids; the ‘good’ fats that have been shown to have heart-healthy effects. One tablespoon of ground flaxseed contains about 1.8 grams of plant omega-3s. Omega-3 fatty acids are a key force against inflammation in our bodies. There is mounting evidence that inflammation plays a big part in becoming weight loss resistant as well as playing a part in many chronic diseases including heart disease, cancer, arthritis, asthma, diabetes, and so on. This inflammation is enhanced by having too little Omega-3 intake (such as in fish, flax, and walnuts), especially in relation to Omega-6 fatty acid intake (in oils such as soy and corn oil). In the quest to equalize the ratio of these two kinds of oils, flaxseed can be a real help. Flaxseed is high in phytochemicals including many anti-oxidants. Research shows that it is perhaps our best source of lignans…which convert in our intestines to substances that tend to balance female hormones. There is also evidence that lignans may promote fertility, reduce menopausal symptoms and have anti-cancer properties and it helps prevent diabetes. Pretty powerful stuff for a tiny little seed. Flaxseed is high in fiber. You would be challenged to find a food higher in fiber-both soluble and insoluble-than flax. Fiber is mainly responsible for the cholesterol-lowering effects of flax. Fiber in the diet also helps stabilize blood sugar, and, of course, promotes proper functioning of the intestines. Note: Flaxseeds need to ground to make the nutrients available otherwise they just “pass through” and flax seed oil alone contains neither the fiber nor the phytochemicals of whole flax seed meal. Benefits of flaxseed are many. It is low in carbohydrates making it ideal for people who wish to limit their intake of starches and sugars. With its perfect balance of healthy fat and high fiber content it makes a great food for weight loss and maintenance. For those trying to lose excess body fat, flax seed helps to keep them feeling satisfied which is a vital element to sticking to a healthy eating plan and not being derailed by those pesky food cravings. Chia seeds are the other super food. 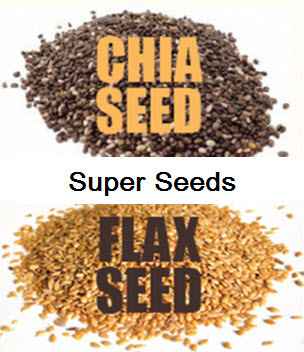 As one of the most powerful and ancient nutritious super foods in the world chia seed is packed with protein, an excellent source of fiber, is full of antioxidants, loaded with vitamins and minerals and a great source of B vitamins including the all-important folic acid and the richest known plant source of omega-3 essential fatty acids. Chia seeds for example have more antioxidants than fresh blueberries, more fiber than bran flakes, five times the calcium of milk, two times the amount of potassium as bananas, three times more iron than spinach and more protein, fiber and calcium than the wonder seed flax seed. Chia seeds include: Phosphorus, magnesium, manganese, copper, niacin and zinc. Chia seeds energize and boost energy levels that last providing stamina and endurance. Adding just 1-2 tablespoons of this seed to your daily diet will give you approximately 7 grams of fiber, 4 grams of protein, 205 milligrams of calcium, and a whopping 5 grams of omega-3. Chia seeds are convenient and versatile, you can eat them straight from the bag, mix them with your favorite drink add them to salad or cereal or anything else you can think of. They do not have to be ground up like flax seeds. The human body easily digests chia seed and with about 7 grams of fiber they actually help with digestion. These wonder seeds fight free radical damage, keep blood pressure and blood sugar under control and have many anti-aging properties. We age when our damaged cells continue to replicate and chia seeds antioxidants act to neutralize the free radicals that cause premature aging and flush out age-accelerating toxins. Chia seeds are good for your pets. Use ½ teaspoon for small dogs and cats and one teaspoon for larger animals mixed into their food…it will keep them in tip top shape. Make sure you soak them in a little water first for a few minutes before adding to their food as they can easily absorb up to 40 times their weight in water and you don’t want your pet to get dehydrated. If a recipe calls for flaxseed you can easily substitute chia seeds. Chia seeds are rather bland in flavor so they work great in or on just about anything. Super-hydration and electrolyte balance. Chia’s soluble fiber massively retains water. It keeps you well-hydrated and maintains your electrolyte balance. Plain and simple, Chia is one of the most nutritious seeds available (if not he most nutritious anywhere) and among the best healthy-building super food or nutritional supplements around. It promotes health in everyone who takes it.